So a bunch of camera modules were made available last week and so I finally went ahead and ordered one for my Raspberry Pi. It arrived in less than a week! However the shipping and tax brought the cost up to $36 Canadian from $25 retail. Oh well, at least I have it now! The obvious first project for the camera module was wireless, battery powered timelapse! I did a similar project last summer with a webcam. However, the camera module is a million times better! It does 1080p video at 30FPS. The quality of the stills is also much better, and its all hardware accelerated! I was able to capture the sun setting over my cul-de-sac. I think the moving shadows are really cool. The setup is very ghetto. I used a makeshift lego case, and a cheap 11200mAh battery from eBay. 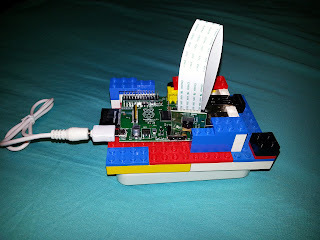 In my next post I will post how to capture live streaming HD video from the Raspberry Pi. Until then keep tinkering!